Romaine lettuce grows in a long head of sturdy leaves which have a firm rib down their centers. These thick ribs, especially on the older outer leaves, have a milky fluid which is unpleasant, so they should not be used, nor should the leaf-tips, which can be bitter. (Although these dark green outer leaves are the most nutritious). The interior leaves are paler in color, and more delicate in flavor. There is also a milder tasting variety with red tipped leaves and a sweet romaine, which is even sweeter than regular romaine. Romaine is the classic lettuce of choice for Caesar salads. 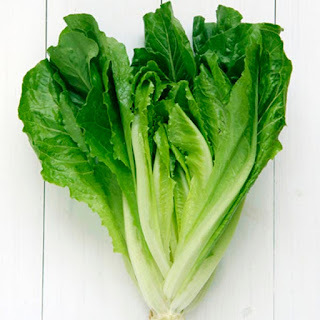 Because it’s said to have originated on the Aegean island of Cos, Romaine is also called Cos lettuce. The high amount of vitamin A found in romaine lettuce is essential for skin health. Studies show that a deficiency in this critical vitamin can lead to a poor complexion. Vitamin C also helps to build collagen in the skin, which is responsible for building firm, healthy skin and preventing loss in elasticity. Both of these antioxidants work together to stop cell damage that can lead to skin cancer. Additionally romaine lettuce supplies nutrients that help defend against acne and inflammation including vitamin A, vitamin C, potassium, B vitamins, and more. Romaine lettuce nutrition can help to get rid of acne since it has a low score on the glycemic index; whereas a diet filled with foods high on the glycemic index, including a lot of sugar, has been shown to be related to acne flair ups.